If you could choose a quote – either by you or another author – to be inscribed on the wall of a public library children’s area, what would it be? At first I was tempted to laugh, because it felt really simplistic (and it also felt like the kind of thing that a lot of mediocre writers would use to defend their mediocre work). But when you really drill down, that is the most important thing in a book. People should want to know what happens next. And, with a very few exceptions (right now the ones coming to me are Proust and a few other experimental French novel), that’s exactly what I look for in a novel. Even when I think of some less-structured books, I realize that there is an element of “And then what happened?” For some reason, I’m thinking of the Sarashina diary, which is a very short, very unstructured memoir by an 11th century Japanese noblewoman. It’s a series of little moments: basically a history of her feelings. But even in that book, I felt like I was reading about someone’s life. I wondered, as I read, what’s going to happen to this sensitive person? Will she endure? Will she be happy? And that point I was like, whoah. What is happening here? I don’t even know that I enjoy this book (the characterization felt a little thin), and yet I want to keep reading it all night. And I realized that the book is just really suspenseful. And, furthermore, it maintained this suspense despite no having an overtly thrillerish plot. In fact, it’s one of the more meandering novels I’ve read: it bumps through the heads of some thirty or forty people, giving most of them a chapter or two. 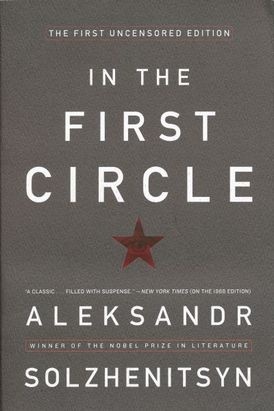 More than anything, it’s simply a realistic account of what life is like in a sharashka (which was a Soviet prison camp where they forced scientists and engineers to do science? It seems like craziness, but it really existed). It’s very simple human drama, mostly. But you just want to know. And I think that’s a fine accomplishment. *As an aside, it feels like American writers have serious oppression envy. Like, the other books in this Banned Books Week promotion were from authors like John Green. I mean…hmm…Solzhenitsyn and John Green. One author served eight years in the gulag, then was permanently exiled, and was only ever able to publish one of his books in his home country. The other one has made millions of dollars and is freely available in 99.9% of the bookstores and libraries in this country. As I’ve noted before, when you drill deep into the Banned Books Week data, you see that there are very few actual book bans in the US. Most of the ‘banned’ books have merely been challenged: all it means is that one person objected to their presence on a curriculum or in a library. And even in cases when books have been pulled from one curriculum or from one library system, it’s not exactly Solzhenitsyn level oppression–it’s just an outlier. I feel like Banned Books Week is just Americans refusing to accept that there really is no statement, no matter how obscene, that will truly be suppressed by the government. I know, it’s kind of disappointing, but that’s just the world that we live in, and I think we need to face up to it. I enjoyed your review. I love books that keep me asking “what happens next.” Even if I don’t like the book I still admire the author’s ability to keep me reading. Yes, it’s a good lesson for all of us. Also, the book pulled me into it and now that I’m a third through I feel way more invested in the setting and characters! Racing through it now.